Adventurers have long since yearned to whirl across the lands of Black Desert SEA while swinging Noble Swords and Crescent Pendulums. Now, they are readying themselves to engage in the dance of death through multiple events and begin the countdown for the release of Lahn, a new playable class! 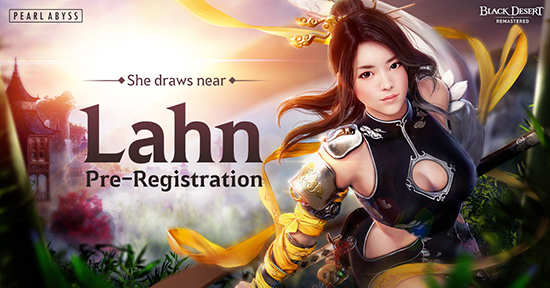 Adventurers that want to start the countdown immediately can get their hands on Lahn early by pre-registering for the class in-game from March 30 until the scheduled maintenance on April 10. Those who sign up within this period will be able to customise their Lahns starting April 3, well before their arrival in Black Desert SEA. They will be able to create the perfect look for their new characters until the end of the pre-registration period. A reward will also be given to everyone who participates in this event in celebration of all the Lahns that will soon be striding nimbly through the clouds. Additional events will also help Adventurers gear up for the moment Lahn arrives in the Black Desert world. Special login rewards will be available daily from March 31-May 15. For 21 days, Adventurers can log in every day to receive rare rewards, such as Advice of Valks and Shakatu’s Luxury Box. In addition, game access packages will be on sale for 40% off from March 30-May 1, so Adventurers can traverse the Black Desert world with friends new and old. Celebrations about Lahn will also be one of the highlights during “Voice of Adventurers II”, Black Desert SEA’s offline event, which took place today. 50 Adventurers met the team behind Black Desert SEA to discuss and celebrate the world of Black Desert together. With discussions about future updates and community suggestions as well as fun activities ending well, the event will no doubt build upon the close relationship between the team and the communities of Adventurers that hold Black Desert SEA dear. Black Desert is an open world action MMORPG with cutting-edge visuals and skill-based combat that redefines the way we see the genre. Black Desert has the most fully developed character customisation system of any game that is currently on the market. This feature allows users to break out of the norm and make unique characters that truly represent each and every player. Its intuitive controls, beautifully designed world and extensive lore will excite both newcomers and veterans of MMO games and action RPGs in general. The game has been successfully launched in over 150 countries, is available in 12 languages and has over 10 million registered users. The mobile and console versions are scheduled to launch globally in 2018 and beyond.